Leksvik Thulite Quarry – Norway, Nord-Trøndelag. The largest find of pink decorative stone – thulite. Thulite belongs to the group of zoisite minerals, it is colored with manganese and serves well as beautiful material for jewellery. Outokumpu uvarovite – Finland, Northern Karelia. Here are found the most beautiful uvarovites – rare green garnets, which reach 2 cm size and often are lucid. Yantarny amber mines – Russia, Kaliningrad Oblast. The site where the first amber mines started to operate in the middle of the 19th century. Currently open pit mine "Primorskoje" is producing some 500 tons of amber per year. Kudriavy Volcano fumaroles – Russia, Kurile Islands. The only place in the world where one of the two rhenium containing minerals – rheniite – is found. Laghman Pegmatites (Nilaw, Mawi, Korgal) – Afghanistan, Nurestan Province. Finds of the best-known kunzite and other types of spodumene crystals (gemstones up to 1 m long), as well as tourmaline (possibly the best elbaite in the world), beryl (morganite, aquamarine, and other types), garnets and other gems. Merit Pila lignite mine – Malaysia, Sarawak. Lignite mine where the largest known pieces of amber are found. The largest extracted piece was 3.5 m long, 1.5 m wide and some decimeters thick, but layers of amber in the lignite are even 130 m long. Mingora emerald mine – Pakistan, Khyber Pakhtunkhwa, Swat Valley. Mines of small, high-quality emeralds, mined since the antiquity. Mogok ruby and sapphire mines – Burma, Mandalay Region. In the river beds around Mogok city are found some of the best rubies and sapphires in the world, as well as some 60 other kinds of gemstones – including such beautiful rarities as taaffeite, sinhalite, johachidolite, poudretteite, and others. Some of the best peridotes are found in Pyaung Gaung mine. Gems are mined here since prehistoric times. Sirenevyi Kamen – Russia, Sakha Republic, Irkutsk Oblast and Zabaykalsky Krai. The only find of beautiful, pink mineral – charoite. In this locality are found numerous other very rare and unique minerals. 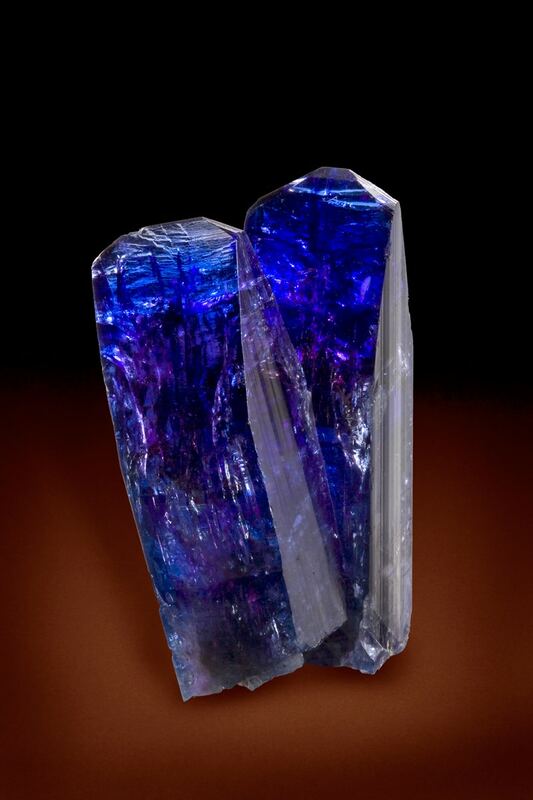 Sar-i Sang lapis lazuli mines – Afghanistan, Badakshan Region. For many thousands of years here is mined the best lapis lazuli in the world. Talesh-Mahalleh – Iran, Mazandaran. An area with the highest natural background radiation in the world, which might exceed 260 mSv and is 200 times greater than normal background levels. This is caused by highly radioactive springs and deposits of uranium and thorium. Anloua swamps – Cameroon, Adamawa. Unique lake deposits whe3re the largest vivianite crystals have been found. Largest crystals were up to 1.35 m long, now are found up to 40 cm long, green and translucent crystals. The formation of such large crystals in lake deposits is unique. Dar al Gani meteorite field – Libya, Al Jufrah. A desert plateau – a famous site where more than 1200 meteorites have been found with total mass over 690 kg. Meteorites here have accrued over an extended time period. Giant crystals in Verloren – Namibia, Khomas. Verloren quartz ridge is formed of giant quartz crystals which certainly reach 20 m length but could be even 50 m long. In some places there are caves formed in sites where giant dolomite crystals have weathered away, leaving voids in even larger quartz crystals. Other minerals also have formed enormous crystals – tremolite needles are up to 20 m long, calcite crystals – up to 1 m long. Kakanda malachite caves – Democratic Republic of the Congo, Katanga. Caves lined with highly unusual malachite stalactites. Found also unique malachite crystals up to 2 cm large. Mainry Labradorite Mine (Norcross Labradorite Mine) – Madagascar, Atsimo-Andrefana. Here is mined one of the finest labradorite varieties in the world. Labradorite here is found in large blocks and has especially bright labradorescence. Malakialina pegmatites – Madagascar, Amoron’i Mania. Rich find of beryls, where reportedly is (or was?) located the largest crystal in the world. This beryl crystal is 18 m long, with 3.5 m diameter, weighs 380 tons. Here has been mined beryl, columbite-tantalite. Merelani Hills – Tanzania, Manyara. World’s only find of tanzanite – unusual, deep blue gemstone. Oklo Mines – Gabon, Haut-Ogooué. The only known site on Earth, where natural nuclear fission has taken place approximately 1.7 billion years ago in some 16 closely located sites. The evidence of this has been testified through unusual composition of uranium, neodymium, ruthenium and other materials. Ol Doinyo Lengai – Tanzania, Arusha. The only known carbonatite volcano in the world. Volcano produces natrocarbonatite lava with nearly unique minerals – nyerereite and gregoryite. Lava flows at very low temperature at 500 – 600 ° C. Carbonates react with moisture of atmosphere and quickly turn white, creating unique volcanic landscape. Orbicular Koppie – South Africa, Northern Cape. Granite outcrop which consists of rare and decorative variety – orbicular granite. Pyrochlore mine of Rutshuru – Democratic Republic of the Congo, Nord-Kivu. One of the largest mines of niobium containing mineral in the world. Scorpion Mine near Mwatate ("Bridges Mine") – Kenya, Coast Province, Taita Hills. One of the few finds of beautiful green gemstone – tsavorite. Silica Glass Valley – Egypt, New Valley. In the western side of the Great Sand Sea can be found pieces of pure, transparent silica glass (Libyan Glass) – the only such find in the world. Largest pieces are up to 26 kg heavy. It has been used as a jewel already in Ancient Egypt. Possibly created by the impact of large meteorite. Tsumeb Mine – Namibia, Oshikoto. One of world’s richest places for mineral collectors, with the best samples of dioptase, cerussite, world’s largest azurite crystals and more than 230 other kinds of minerals. Wegel Tena Opal Fields – Ethiopia, Welo. 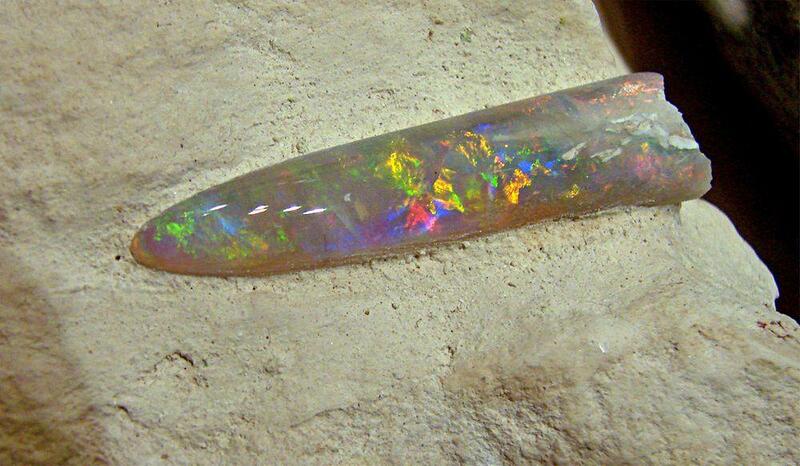 Recent find of top quality opal, which has unusual effect – when immersed in water, it becomes fully transparent. 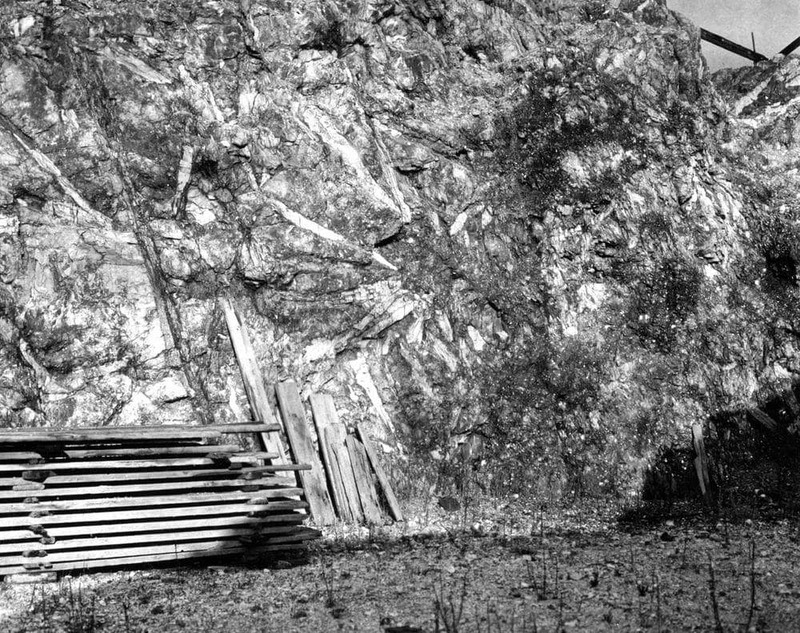 Acasta Gneiss – Canada, Northwest Territories. The oldest known piece of continental crust, 4.031 – 3.58 billion years old, oldest known rock in the world. Asuk beach, Uivfaq beach and other finds of raw iron in Disko Island – Greenland, Qaasuitsup. Some of the richest finds of native iron in the world. Largest iron boulder was 22.7 tons heavy. Cave of the Crystals, Naica (Cueva de los Crystales) – Mexico, Chihuahua. 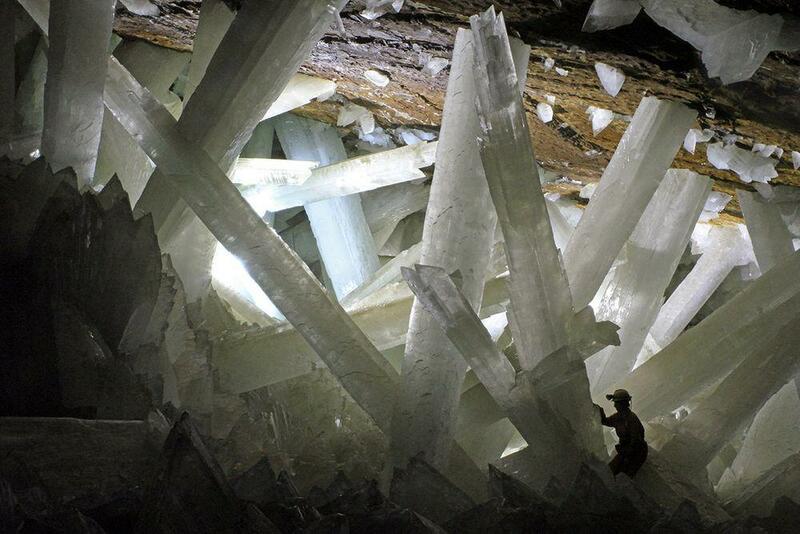 Cave with giant selenite crystals up to 12 meters long and 55 tons heavy. Air temperature in the cave is up to 58 °C high. Etta pegmatite mine – United States, South Dakota. Abandoned mica and tin mine, where some of the largest known crystals have been found. Here have been found up to 12.8 m long and 65 tons heavy spodumene crystals, many very large crystals still are seen in the walls of quarry. Franklin Mine – United States, New Jersey. "Open air museum" of mineralogy, with more than 350 kinds of minerals, some found only here. Contains many interesting fluorescent minerals. Ikaite tufa columns in Ikka Fjord – Greenland, Sermersooq. Almost unique phenomenon – submarine tufa columns created by cold seeps from submarine springs. Columns are formed of ikaite – unstable mineral which disintegrates in temperatures above 6 – 7 ° C. In total here are more than 600 such columns up to 18 m tall. Ilimaussaq intrusive complex – Greenland, Kujalleq. Very unusual alcalic intrusion, 8 by 17 km large. Contains numerous unique types or rocks and many very rare minerals, uranium deposits and large deposits of rare earth elements and other rare metals. Ivittuut – Greenland, Sermersooq. Abandoned mining town, which developed around the only large find of cryolite in the world. Cryolite – important agent in extraction of aluminium – was discovered here in 1799, mining took place in 1859 – 1987. Today natural cryolite is replaced with synthetic one. Kvanefjeld – Greenland, Kujalleq. Second largest deposit of rare earth oxides in the world, also a very rich find of uranium. Minerals are enclosed in unique rock named lujavrite, some minerals are fluorescent. Mont Saint-Hilaire – Canada, Quebec. 414 m tall mountain, with one of the last stands of primeval forest in Saint-Lawrence valley. Mountain has very high mineral diversity, here have been found 366 minerals, many are unique or near unique to this site. Here was discovered poudretteite – seven pieces of this beautiful gemstone have been found on this mountain. Legendary site, known also thanks to frequent observations of UFO’s. Palo Quemado blue amber mine – Dominican Republic, Santiago province. The richest (and almost the only) find of the fluorescent Dominican blue amber, which changes its color according to lighting conditions. Red Beryl finds in Wah Wah Mountains (Maynard’s Claim, Violet Mine and others) – United States, Utah. Finds of the very rare red beryl – bixbite. Abingtonite of Pinta – Ecuador, Galápagos, Pinta. Unique basaltic lavas with enormous crystals of plagioclase. This rock is named abingtonite and is found only on Pinta as well as in smaller quantities in the northern Galápagos islands. Anahí Mine – Bolivia, Santa Cruz. Richest find of the best ametrine in the world. Ametrine is a rare variety of quartz in golden and purple colors. Jadeite mines near El Ciprés – Guatemala, Zacapa. Some of the best finds of Maya jadeite – beautiful green gemstone of great importance to ancient Mesoamerican cultures. Mina da Batalha – Brazil, Paraíba. Mine where the unique Paraíba tourmaline is found. This beautiful gemstone contains copper and thus is colored in amazing blue-green color not met in any other tourmaline in world (except in Nigeria). Payún Matru hematite crystals – Argentina, Mendoza. A site, where can be found amazing hematite pseudomorphs after magnetite – black, shiny crystals. Rio Itoco emerald mines in Muzo – Colombia, Boyacá. The site where the best emeralds in the world are found. Other famous Colombian mines are in Chivor and Coscuez. Yungay – Chile, Antofagasta. 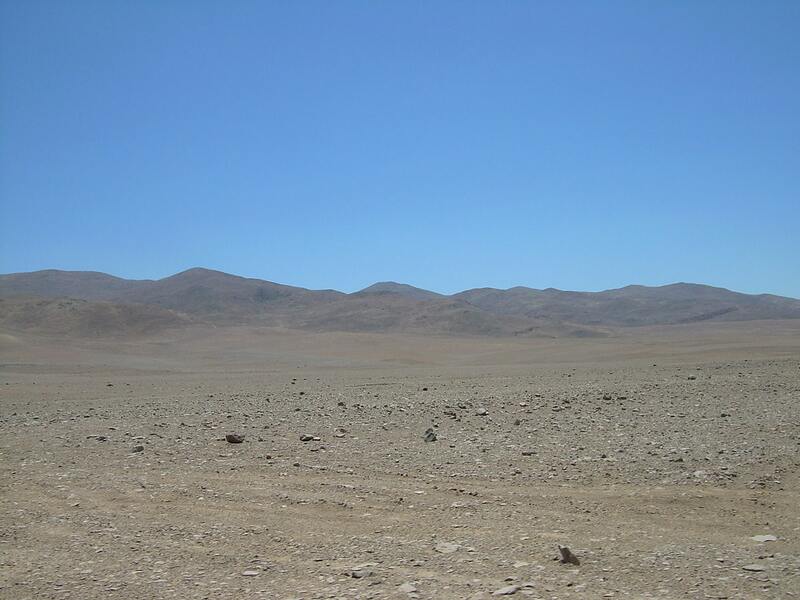 Part of Atacama Desert, considered to be the driest place in the world without any signs of life. Only few specific microorganisms – extremophiles – are present here and some areas seem to be devoid of any life. Some areas are rich with nitrates – easily soluble minerals which in other circumstances are consumed by organisms. Here rich nitrate deposits have been formed from atmospheric nitrogen, possibly by lightning. The only location on Earth where some perchlorates and iodides are found. Central Lanthanide Deposit in Mount Weld – Australia, Western Australia. 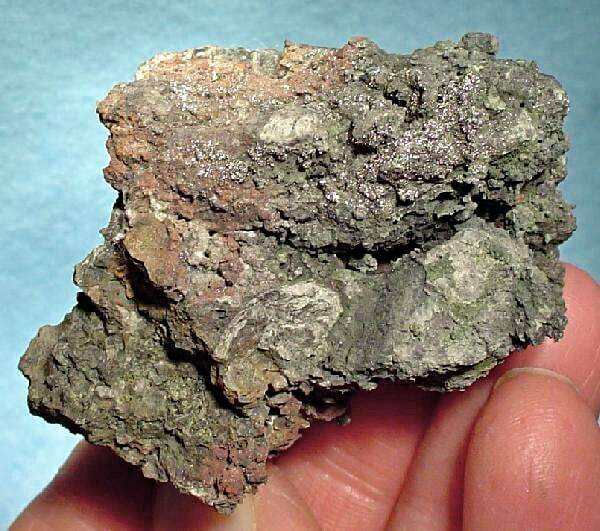 Spectacular, unique enrichment of rare earth deposits, carbonatite rock rich with niobium/ tantalum and other rare metals, such as terbium, europium, dysprosium and others. Coober Pedy Opal Mines – Australia, South Australia. World largest find of gem quality opal. Daikoku Sulphur Cauldron – Northern Mariana Islands, submarine volcano north from Farallon de Pajaros. A unique pool of liquid sulphur, possibly the only one in world. Népouite find in Népoui Mine – New Caledonia, North Province. 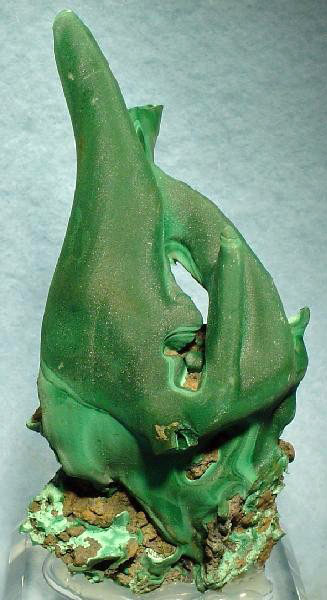 Type locality of spectacular, bright green mineral, which contains much nickel. NW Eifuku Champagne Vent – Northern Mariana Islands, submarine volcano north from Farallon de Pajaros. A submarine vent which emits almost pure liquid carbon dioxide at 1,600 m depth. Such phenomenon is known in three places on Earth and at Eifuku it is most abundant. White Cliffs Pineapple Opal Fields – Australia, New South Wales. Find of unique opalised fossils and crystals of other minerals replaced with opal. Often these opal stones look like clusters or balls of radiating crystals. Zircons of Jack Hills – Australia, Western Australia. The oldest known terrestrial material on the surface of Earth, these crystals of zircon formed some 4.4 billion years ago. Oldest crystal was found on Eranondoo Hill – 4,404 million years old. Exploration of this material provides new information about early history of Earth. Erebus Crystals – Antarctica, Victoria Land. Deposit of large anorthoclase crystals in the center of caldera of volcano. Lake Bonney – Antartica, Victoria Land. Frozen lake with unique geochemistry. The east lobe of the lake is saturated with nitric oxide – "laughing gas" and dimethylsulfoxide. Another part of lake is rich with dimethylsulfide – possibly produced by microorganisms. There are places in the world, where one can find such materials which are not present anywhere else on Earth – or can be found just in a few places. Such landmarks are included in this category – category of rare natural materials. There is also separate category for the most interesting gemstone finds on Earth. Locations with high mineral diversity. In some locations complex geological history and several coincidences have led to very high mineralogical diversity. One of the best known is Franklin Mine in United States with more than 350 minerals present, Mont Saint-Hilaire in Canada has at least 366 minerals. Unique and very rare mineral finds. Most of the more than 4500 minerals (and even more varieties) are very rare. Many have been found just in one location – but some of these are very interesting. Thus, fumaroles in Kudriavy Volcano in Kurile Islands, Russia, are producing crystals of the only rhenium containing mineral – rheniite. Materials in extreme environments. At low temperatures, high pressure, extreme dryness can exist natural minerals, which in common circumstances would not form and exist. 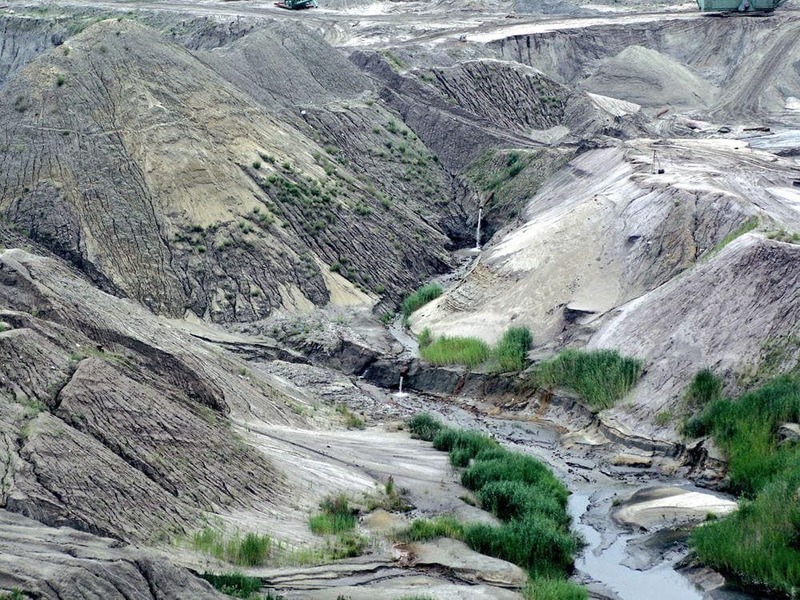 Thus, in Yungay (Chile) can be found sediments of nitrogen compounds (possibly formed by lightning), which can exist only due to the extreme dryness. Giant crystals. Crystals of some minerals can reach incredible size. Thus selenite crystals in the Cave of the Crystals (Mexico) are up to 12 m long, but in Verloren (Namibia) the largest quartz crystals could be even 50 m long! How will your life change when the supply of tantalum dries up? You may have never heard of this unusual metal, but without it smartphones would be instantly less omniscient, video game systems would falter, and laptops fail. Tantalum is not alone. Rhodium. Osmium. Niobium. Such refugees from the bottom of the periodic table are key components of many consumer products like cell phones, hybrid car batteries, and flat screen televisions, as well as sophisticated medical devices and even weapon systems. Follow in the footsteps of successful gem and gold hunters and search the hills for rough diamonds, colored gemstones, lapidary minerals, precious metals and interesting minerals and rocks. Written for the geoscientist, prospector and rockhound; the first part of the book focuses on physical characteristics of gems and minerals.